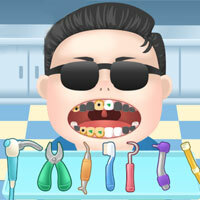 Popstar Dentist Popstar Dentist is the best mobile game.Some celebs need dental treatment urgently. Help Justin Bieber, PSY, Bruno Mars or Rihanna to get their cheesy grin back. As the promising Popstar Dentist you must offer different dental techniques to help your patients. Be careful.have fun and good luck.do your best.